A Four-Mile Commute on Two Wheels Rebecca Roberts joins two of her colleagues and thousands of fellow Washingtonians for National Bike to Work Day. She avoids being crushed by a garbage truck and enjoys an experience that she has to admit was "downhill all the way." Thousands of cyclists turned out for National Bike to Work week in Washington, D.C.
Business suits and lyra shorts mixed on the streets of the nation's capital, making spokes a common bond. Ah, the joy of a bike ride. Cool breeze, sun at your back. But also narrow streets and rude drivers. Not to mention menacing dogs and murderous buses. So why does anybody bike to work? 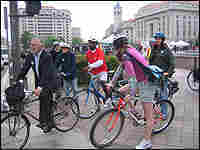 Friday was National Bike to Work Day, and the commuting cyclists in Washington, D.C., ranged from intimidating athletic types in the latest moisture-wicking lycra to smart-looking professionals in well-tailored suits and sensible low-heeled pumps. The question is, what was I doing among them, biking to NPR with a microphone cleverly tethered to my helmet? Well, it was all producer Ned Wharton's idea. 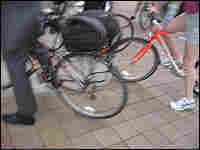 But he was aided and abetted by Eric Gilliland, executive director of the Washington Area Bicyclists Association. Earlier this week, Gilliland mapped out a four-mile route for me, Ned, and engineer Rob Byers to bike from my house to NPR. It could have been shorter if I hadn't been so adamant about avoiding D.C.'s notoriously chaotic Dupont Circle. Gilliland also offered biking tips and some perspective on urban bike commuting. On Friday morning, Ned and Rob, both veteran cyclists, checked out my bicycle, then we pedaled off into the wilds of D.C.
We lucked out on the weather. It was cool and comfortable, with a refreshing misty drizzle. And despite a few baffled looks at our curious recording equipment, it was a pretty uneventful half-hour to reach downtown. We didn't see too many other bike commuters, but we found them at a bike-to-work rally at Freedom Plaza near the White House. As promised, Eric Gilliland was there, too, encouraging the crowd to "keep it up and do it more often." Adrian Fenty, mayor of the nation's capital, shared the sentiment. "Let this not be the last day that any of us bikes to work this year," he said. Fenty, an avid biker, was fully decked out in Spandex and a racing jersey. He pumped up the crowd from the podium. 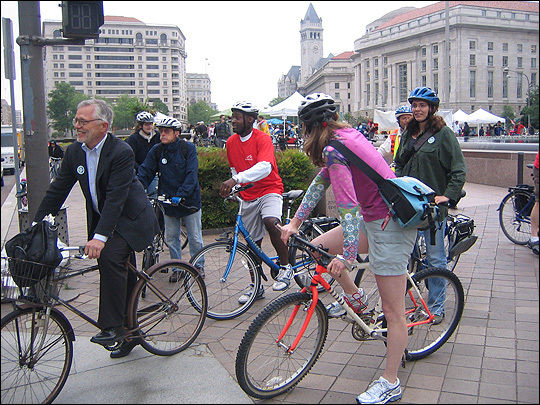 His administration promotes policies to encourage bike commuting in the District of Columbia. The man responsible for implementing those policies is Dan Tangherlini, the city administrator. "We've been adding bike lanes, we've been adding bike racks," he said. As for a two-wheeled commute, he added: "You don't get quite the same feeling in a car." In the end, fears such as being crushed under the wheels of a garbage truck proved unfounded. And whatever the reasons — exercise, cost, environmental friendliness — the small but dedicated number of folks who bike to work really feel they're on to something. And maybe they are. As for me, I must admit the ride to NPR was all downhill. I had an event after work, so I have yet to bike home.